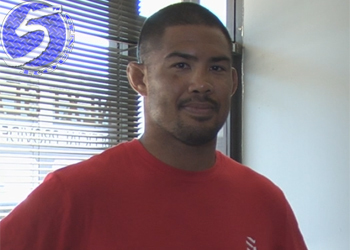 Mark Munoz (pictured) returned to the Octagon on Saturday night at UFC 162 after taking a year-long hiatus. During that time, Munoz battled injury, obesity and depression. However, “The Filipino Wrecking Machine” came storming back with plenty to prove against a brutal opponent in Tim Boetsch. Munoz dominated most of the action, pulverizing Boetsch with his “Donkey Kong punches” – AKA vicious ground-and-pound. When the dust settled on their shootout, Munoz walked away with a unanimous decision victory, and of course, his trademark smile. UFC 162 took place inside MGM Grand in Las Vegas, Nevada.